When purchasing goods worth of £125 or more we deliver goods for free to most of EU countries. Incredibly large rose in glass dome. Free UK delivery. What makes Nottas & Belle’s Forever Rose so special is that it encases a real freshly-picked rose in a beautiful glass dome. This unique preserved rose in glass began as a regular rose, grown at Notta & Belle’s own plantation, and plucked from an abundant bush of this ‘queen of flowers’. Each rose - although only if perfect in appearance, with no imperfections whatsoever - is then preserved using special stabilisation technology, so it will live on and on. While there are other gifts that appear to be similar to ours on the market, in actuality, your preserved rose in a glass dome is the most luxurious available anywhere, as often other roses in glass are artificial. Each and every Notta & Belle ‘Forever Rose’ is as real and pure as the day it was picked - and will be for at least five years! We like to call our preserved roses in glass by this name, as it will forever be in the heart of the recipient, who will truly understand how much they mean to you upon receiving such a thoughtful, luxurious and one-of-a-kind gift. 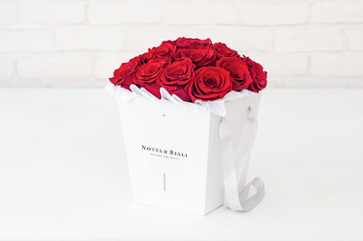 Even better, the loved one you gift the Notta & Belle preserved rose in glass dome to - whether that’s a boyfriend, girlfriend, husband, wife, beloved friend, adored colleague or cherished relative - will get to feel like they are in a real-life fairytale. 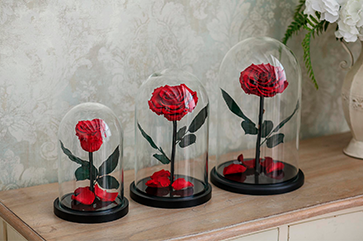 Our preserved roses exactly replicate the enchanted rose from beloved animated film ‘Beauty & the Beast’. 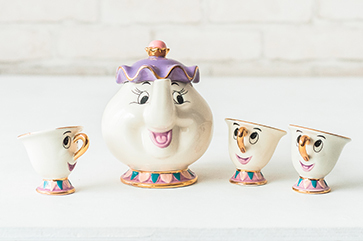 In this classic Disney tale, this mythical, spellbound rose is a symbol of the Beast’s love, which he ultimately devotes to the beautiful Belle. By gifting a Notta & Belle preserved rose in a glass dome, you too can give your special recipient princess status. Gift your princess the absolute perfect item, by customising the preserved roses in glass to exactly fit their tastes. 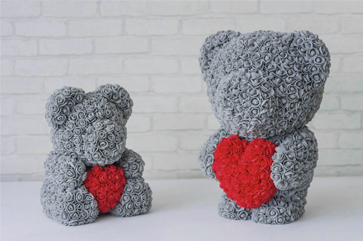 Our roses are tinted in an array of eye-catching colours - from classic red to Tiffany blue - and can include an engraved message of your choosing, in addition to special gift-wrapping options to totally woo her. “Roses are not only for birthdays and special occasions, because sometimes all you need is to just take some bit of heaven and share it with the ones you love”, - unknown. We couldn’t agree more. Every day is a day to gift a rose - the ultimate symbol or love, passion and beauty. Through the gifting of each and every one of our preserved rose in a glass dome we wish to remind you that love is infinite and forever and a thing of true and pure beauty, which never leaves us, even as the stories of our lives unfold and we together grow old. Unlike everything else in this world however, our preserved roses in glass will never become older. Their beauty lives on, just like your love. By continuing to use our site you consent to the use of our cookies. Informace.